I was up and able to disarm the 07:00 alarm shortly before it sounded this morning. Having laid out all my gear and provisions for my morning’s SCUBA diving activities last night already, I was able to make a swift and quiet getaway before the kids awoke. The main breakfast buffet opened at 07:00 and my pick-up was scheduled for 07:45, so I would at least eat my fill before being whisked away. The pre-arranged taxi was there waiting for me and, as it turned out, so was one other passenger, for the 5 minute drive along the coast to the dive school. Once there, I met up with Gary, the guy with whom I’ve been e-mailing back and forth over the past couple of weeks. As it turned out, he has only recently bought the dive school and had consequently stocked up with new kit. My BCD, fins & regulator were all practically brand new. There would just be a handful of divers going out this morning and it would just me, the other guy that shared the taxi with me and our dive master were going to be going under together as a small group. A rather dilapidated looking Scooby-Doo’esque minibus would take us and all our pre-assembled gear yet another five minutes along the coast to a very secluded and out of sight little beach, where a small launch awaited us. This launch would take us literally just a couple of minutes out to what appeared to be a gap in the lagoon breakers, where we would connect to a buoy and gear up for our decent. Having not dived in over 7 years, I have to admit to a fair degree of trepidation about getting into the water again. When we were travelling, we did a live-aboard up and down the Great Barrier Reef and I remember one dive in particular, a wreck dive just off the coast near Ayr - the SS-Jongala, where we descended along a buoy line in what seemed like a thick soup or cloudy water. My wet-suit was far too tight at the time and I felt very restricted. ￼Once I was in the water, my breathing was laboured and when we got to the bottom end of buoy line, I had what I can only describe as a panic attack. I was disorientated due to all the debris moving in the water and I had a sudden and irrational urge to get to the surface to take a breath of air - despite the fact that I was breathing through a perfectly functional regulator. I started breathing very rapid and shallow breaths and I started to feel like I wasn’t getting any air at all. The situation was extremely tenuous. If I had succumbed to the urge and rushed to the surface, I could very easily have suffered decompression sickness or worse. Fortunately, one of the more experienced divers saw what was happening and helped me resolve the situation by looking at me square on and encouraging me to breath slowly and regularly. As the hyperventilation started to subside, I started to calm down and the panic eventually subside. I was fine from that point on. All of this was going through my mind as we reverse rolled into the water this morning. I inflated my BCD and tested the regulator. Already, I started to feel that same, familiar feeling of terrible apprehension again. I think this was partly because I had put too much air into my BCD and my chest felt constricted as a result. The boat driver handed me my camera equipment. It didn’t take me long to come to the realisation that perhaps my first dive would not be the best time to try to re-familiarise myself with underwater photography again. ￼I decided on the spot that I should instead just concentrate on getting conformable in the water again first. I still felt a little apprehensive during the decent. Once we had descended and I got myself horizontal, however, I felt very much more comfortable again and was fine from that point onwards again. It was kind of like riding a bike again after a long time. The familiar routine of equalising, checking depth, air pressure, my dive computer and clearing my mask pretty much immediately kicked in and I could concentrate on just enjoying the dive. As it turned out, there wasn’t an awful lot of the dive to really enjoy. The dive site itself was actually not particularly interesting. There was plenty of hard coral, some soft coral and some marine life but not that much. As the other diver in my group agreed, I think the problem is that we’ve been spoiled, having already dived extensively and at some of the more interesting dive sites around the world. The sad fat is that the Coral Coast here in Fiji, at least if this one dive site is a good guide, just pales in comparison to other dive sites that I’ve dived. All in all, I’d have to say that this particular dive was disappointing. Hopefully, the second and final dive of the day would be better. So, with everyone finally aboard and with not a hint of sea-sickness anywhere in sight, the boat meandered the few minutes back to the beach, where we ended up staying for half an our or so for our surface interval. A few divers left and one or two more replaced them for our second and final dive of the morning. The second dive site was, again, just a few minutes boat ride away and, this time, I felt confident enough to take the camera equipment down with me. Whether the camera, which is only rated to 10 meters, would survive the dive was always going to be a crap-shoot but I had decided to risk it anyway. The second dive was a bit of a mixed bag. It was a very much better dive site with a lot more interesting things to see, including interesting crevices, caves and swim throughs. There was also a bit better marine life too, including a whole garden of anemones with all sorts of clown fish tending them towards the end of the dive. Unfortunately, the flip side of the coin was the camera, which lasted all of around 4 minutes into the dive before starting to give me trouble. ￼I got maybe 2-3 shots before the screen failed. It was apparently still taking photos each time I depressed the shutter but I couldn’t see them and had no feedback over what the photo looked like or even whether it was properly exposed or in focus. It wasn’t until later this evening that we determined that it had partially flooded through one of the lesser used seals. Unfortunately, although there was more to see, I probably wasted the bulk of the dive sodding around with the camera trying to get it to work. Somewhat annoyingly, I started with only 180 bar of air instead of the 200 that you’re supposed to. Once again, then, I was the first to signal to the dive master that I was low on air - despite a concerted effort on my part to drift several meters above everyone else throughout most of the dive. So, with both intended dives now complete and we were on our way back to the beach again, I reflected on the day’s diving. Ultimately, although I lost a perfectly good underwater camera and didn’t get to see that much by way of interesting things, I would still characterise the morning as a success. I did, after all, come back alive and well. The minivan was loaded with all the gear by the dive masters and we were whisked back to the dive school, where all the gear was flushed through with fresh water and I got my dive log stamped for the two dives. The plan is to do another couple of dives on Thursday as well as a couple of night dives - one on Thursday and on on Friday. ￼Sandy is planning on doing a couple of dives on Friday, all things being equal. The taxi driver that ferreted us back to the Outrigger On The Lagoon resort did his best to pitch his company’s services to us and made sure to point out that a taxi ordered through them would be much cheaper than one arranged through the resort. Of that, I have no doubt. Back at the resort, I found Sandy and the kids just finishing up a stint down at the pool. The kids were booked into the kids club for both the afternoon and evening sessions today so we took them over to drop them both off. No problems with separation anxiety at all today - for parent and child alike. The Bebe Spa is perched high atop a hill directly opposite the main resort property. You can see it from just about every vantage point within the resort and it makes for an impressive sight. A motorised buggy whisks you up the hill along a winding road to the spa’s reception area. I have to say that the whole place looks gorgeous. The lush foliage, fish-ponds and thatched roofs all look pristine and inviting. I was ushered into a spacious and open waiting room which had panorama floor to ceiling windows an three sides with views out onto the resort below and sea in the distance that are just breathtaking. A number of comfortable lounges & chairs lay invitingly, as I was handed a tray with a moist towels and small cup of herbal tea. On the balcony, were several double lounges that were clearly made for two. With the sun beating down and the stunning views before you, this looked like a particularly comfortable place to relax before and after a spa treatment. Along with another couple, I was led to the changing rooms and handed a locker key. The woman staff member quickly went through her well-rehearsed explanation of what to expect. She suggested that we get changed and to put on the robe that we would find waiting for us in the locker. She also said that we could, if we so chose, to don the disposable briefs that we’d also find there. Although not very big, the changing area was very well appointed with fresh flowers everywhere and looked pristine and new. I took the disposable briefs out of the little sealed bag and put them on. Now, I’m not trying to brag here or anything but when she said briefs, she really meant ‘brief’ and I had some difficulty managing to, erm, ‘contain myself’. Still, it was that or allow myself to let it all hang out, so to speak, and I wasn’t sure of what the customs here were. Personally, I would have had absolutely no problem with this but I really wasn’t sure if that was the ‘done thing’ here in Fiji or not so I just decided go with it ... briefly, if you get my drift. I was next led into my treatment room, which consisted of a regular massage room complete with massage table clad with towels and an outside balcony, which included a shower, sunken bath and a chair with a bowl of warm water in front of it. It seemed that the first part of my treatment was to involve a foot cleaning and exfoliating. I can’t say this did much for me but the view over the balcony was stunning and so I enjoyed the experience. Next, it was onto the massage table for my main spa treatment, which involved an hour and a half massage with eye mask. It was so relaxing that I have to admit to having actually snored intermittently. I apologies to the masseuse for this, which made her chuckle. ￼In my subsequent hazy daze of relaxed’ness, I made my way over to the changing rooms to shower away all the oils that had just been applied. The showers themselves were fantastic. Just the right amount of water and with a temperature control that was very accurate. Bliss. Since I had the forethought to bring my camera with me, I spent some time taking some photos from every angle - but not before indulging in a little rest and relaxation on one of the double loungers on the waiting room balcony. By this time, a wedding party was starting to assemble. One of the staff told me that they had weddings here near enough daily. With my time at the spa having finished, a motorised buggy was summonsed for me and I was taken back to the main resort again. Once again, Sandy and the kids were just finishing up another pool session. As it happened, I had also just missed a display of traditional Fijian dancing and singing. Still, there was going to be a Fijian firestone walking display shortly so we collected ourselves and made our way over to an amphitheatre over on the other side of the resort that I hadn’t even realised was there until now. The firestone walking ceremony involved a half dozen traditionally clad Fijian men using various wooden staffs and logs to ceremonially prepare the pit of rocks that had for the previous five hours been baking in a roaring bonfire furnace. A Fijian elder was addressing the hundred or so spectators and telling the attentive crowd about Fijian life in general. I found it very interesting. Eventually, the pit of stones was declared ready and the Fijians then proceeded to walk - slowly and repeatedly - over the hot stones one by one. It was an impressive display. Our dinner for the evening was to be at the main buffet restaurant again tonight. Although there was a lot of choice on offer, much of it was the type of food that I wouldn’t eat if I had the choice and so pickings for me at least were slim. Still, they were more than accommodating in bringing us out a couple of plates of chips so that was good. We got chatting to one of the waitresses and she eventually pried loose from us the fact that it was the kids’ birthdays last week and our 24th wedding anniversary. Although we were keen to finish up and get the kids back into the kids club for the remainder of the evening session, Emma, our waitress, suggested that we hold on for a bit as they wanted to present the kids with a little something special. We had assumed this was just going to be a bit of cake for the kids’ birthdays. In fact, it was starting to take quite a bit of time and the kids were getting really antsy and starting to drive us both nuts. Just as we were thinking that they’d forgotten about us or had given up on the idea, we heard some clapping and looked over to see a procession of staff singing and making their way towards our table. ￼About a dozen staff ultimately encircled out table and started singing a sort of Fijian style happy birthday song for the kids and a fabulously decorated plate of chocolate cake slice with a lit birthday candle was duly presented to the kids. Their names and and a happy birthday greeting was ‘painted in chocolate’ onto the rim of the plate. It looked absolutely wonderful and the kids really got a kick out of it. Just as we thought that was it, they started up again with another song - this time a sort of Fijian style happy anniversary song, as yet another plate of chocolate cake slice was presented to Sandy and me. This plate had our names and an anniversary greeting also written in chocolate on it’s rim. The anniversary song went on for several versus and I have to say that it sounded absolutely divine. Very tuneful and full of complimentary harmonics. It was definitely worth the wait and made us feel very special. For several minutes, we had the attention of the entire restaurant and we just basked in the glow of it all - it instantly became easily one of the highlights of the trip so far. As promised, the kids spent the next hour or so back in the kids club, whilst Mummy and Daddy enjoyed a brief bit of Mummy and Daddy time together. As we collected the kids at around 20:45, some very loud music started blaring out somewhere very close to our bure. 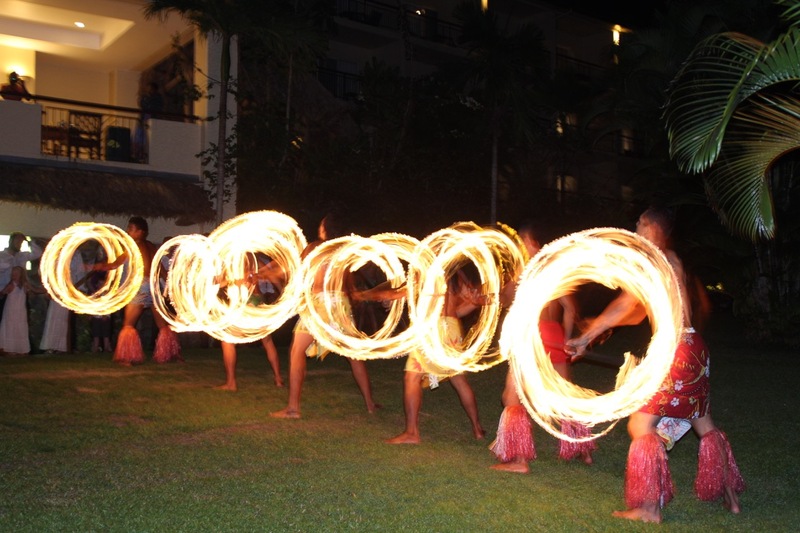 It turned out to be a very nice fire dancing display on a small patch of grass just behind our bure. We spent a few minutes watching the brief display before heading back inside, one and all, to finish our fun-filled third day in Fiji. What a wonderful day it has ben today. Both kids did come home from the kids club with some insect bites up and down their legs and the itching was causing Jennifer some grief but, fortunately, Sandy had packed some tea-tree oil and bandaids (along with the kitchen sink) and that together with the kids’ tiredness ensured a rapid bedtime routine with relatively little fuss.